Hufflepuff is one of the four Houses of Hogwarts School of Witchcraft and Wizardry. Its founder was the medieval witch Helga Hufflepuff. Hufflepuff is the most inclusive among the four houses; valuing hard work, patience, loyalty, and fair play rather than a particular aptitude in its members. The emblematic animal is a badger, and yellow and black are its colours. The Head of Hufflepuff is Pomona Sprout and the Fat Friar is the House's patron ghost. Students belonging to this house are known to be hard-working, friendly, loyal, honest and rather impartial. It may be that due to their values, Hufflepuffs are not as competitive as the other houses, or are more modest about their accomplishments. Hufflepuff is the most inclusive among the four houses; valuing hard work, patience, loyalty, and fair play rather than a particular aptitude in its membersments. 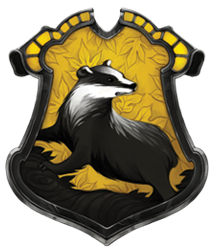 Hufflepuff appears to have the least rivalry with the other houses, except in Quidditch, although the Triwizard Tournament did temporarily put a great deal of strain on the relationship between Gryffindor and Hufflepuff, due to unusual circumstances of the selection of both Gryffindor student Harry Potter and Hufflepuff student Cedric Diggory as Champions. According to Minerva McGonagall, all four of the houses have produced exceptional witches and wizards in their time, but due to Helga Hufflepuff's policy of accepting any student and its usually poor performance in the House Cup, Hufflepuff is often thought to be the house of less talented wizards. However, this is merely a misunderstanding of the Sorting Hat's poem. The Hufflepuff house has produced a great many of successful and influential members of the wizarding world. Hufflepuff has produced the fewest number of dark wizards than any other house at Hogwarts. Their cheerful and friendly demeanor can probably account for this property of the House. Hufflepuff firmly demonstrated its loyalty during the Battle of Hogwarts in 1998, when they were second only to Harry Potter's own house of Gryffindor in the number of students willing to stay and fight against Voldemort and his forces in the defence of their school. As a security device to repel non-Hufflepuffs, tapping on the wrong barrel, or tapping the incorrect number of times, results in one of the other lids bursting off and drenching the imposter in vinegar. The Hufflepuff's head of house before and during Harry Potter's time was Pomona Sprout. She was the Herbology professor at Hogwart School of Witchcraft and Wizardry. It is possible that before Pomona was appointed as the Herbology professor and made head of house that Herbert Beery the previous Herbology teacher was the head of house, depending on if he was a Hufflepuff or not. Medieval era Founded the all-wizard village of Hogsmeade. c. 1213 to 1220 Famous Arithmancer who discovered the magical properties of seven. c. 1765 to 1772 Minister for Magic from from 1798 to 1811.
c. 1781 to 1788 Minister for Magic from from 1811 to 1819.
c. 1908 to 1916 Famous magizoologist and Headmaster of Hogwarts School of Witchcraft and Wizardry. unknown Minister for Magic in an unknown period. Inventor of the Self-Soaping Dishcloth. 1942 - 1949 or 1952 - 1959 Later professor of Herbology and Head of Hufflepuff House. 1984 - 1991 Auror and a member of the Order of the Phoenix. Wed to Remus Lupin and mother of Teddy Lupin. She was killed in the Final Battle. Cedric Diggory 1989 - 1995 Prefect, Captain and Seeker for the Hufflepuff Quidditch team, Triwizard Champion; killed in his sixth year. Anthony Rickett 1990s Beater for the Hufflepuff Quidditch team. Cadwallader Chaser for the Hufflepuff Quidditch team. Gregory Munslow Only seen in the Harry Potter and the Half-Blood Prince (video game). Heidi Macavoy Chaser for the Hufflepuff Quidditch team. Herbert Fleet Keeper for the Hufflepuff Quidditch team. Malcolm Preece Chaser for the Hufflepuff Quidditch team. Beater for the Hufflepuff Quidditch team. Summerby Seeker for the Hufflepuff Quidditch team. Tamsin Applebee Chaser for the Hufflepuff Quidditch team. Zacharias Smith Chaser and Captain of the Hufflepuff Quidditch team; member of Dumbledore's Army (abandoned). Justin Finch-Fletchley 1991 - 1997 (?) Member of Dumbledore's Army. Due to Muggle-born status, most likely did not attend his final year, during which Lord Voldemort controlled Hogwarts and the Ministry of Magic. Ernie Macmillan 1991 - 1998 Prefect and member of Dumbledore's Army. Hannah Abbott Prefect and member of Dumbledore's Army. Married to Neville Longbottom. Leanne Friend of Katie Bell and witnessed her being cursed. Fought in the Battle of Hogwarts. Survived the war. Susan Bones Member of Dumbledore's Army. Was the first to Splinch herself in Apparition lessons. Heather 1992 - 1999 Duelling Club member. Hufflepuff has produced the fewest Dark wizards of all the four Houses, if any. Giffard Abbott was most likely a Hufflepuff, given his attitude towards this House and sharing a surname with known Hufflepuff Hannah Abbott. Amos Diggory may have been a Hufflepuff if he attended Hogwarts, as his son Cedric was. The most members of Hufflepuff house appear to have either blonde or brunette hair, while Susan Bones and Helga Hufflepuff had reddish hair. Furthermore, Professor Pomona Sprout often wore brown clothes. Interestingly, this is reminiscent of the house attributions; brown/brunette is associated with the element of earth and is similar to black (one of the Hufflepuff colours). Likewise, blonde hair could represent yellow — another house colour. The Hufflepuff Basement was the only common room that Harry Potter didn't enter during his years at Hogwarts. On Harry Potter: Beyond the Page, J.K. Rowling had this to say about Hufflepuff House..."This may surprise people, but it is the truth...In many, many ways, Hufflepuff is my favourite House. Here's my reasoning, bear with me. (Again, I don't want to spoil things too much for people who haven't read the whole series, so I'm going to say what I'm about to say quite carefully). There comes a point in the final book where each House has the choice whether or not to rise to a certain challenge, and that's everyone in the House. The Slytherins, for reasons that are understandable, decide they'd rather not play. The Ravenclaws, some decide they will, some decide they won't. The Hufflepuffs, virtually to a person, stay, as do the Gryffindors. Now, the Gryffindors comprise a lot of foolhardy and show-offy people, that's just the way it is, I'm a Gryffindor, I'm allowed to say it. You know, there's bravery, and there's also showboating, and sometimes the two go together. The Hufflepuffs stayed for a different reason; they weren't trying to show off, they weren't being reckless, that's the essence of Hufflepuff House. Now my oldest child (my daughter, Jessica) said something very profound to me, not very many days ago, actually, she said to me --and she, by the way, was not sorted into Hufflepuff House-- but, she said to me, 'I think we should all want to be Hufflepuffs.' I can only say to you, that I would not be at all disappointed to be sorted into Hufflepuff House." Gabriel Truman states that Hufflepuffs are often good at Herbology. Neville Longbottom was known to excel at Herbology but was placed in Gryffindor, despite begging the Sorting Hat to place him Hufflepuff. Hufflepuff House won the fourth House Cup on Pottermore. In the video game adaptations of Harry Potter and the Philosopher's Stone and Harry Potter and the Chamber of Secrets, the Hufflepuff robes are purple, instead of yellow. This page was last edited on 10 May 2017, at 21:06. This text is available under the GNU FDL and may have been adapted from the Wikipedia article about Hufflepuff (history).